Almost every crop circle around the world, that their "explorers" characterise as so called "genuine", because they arised, from their point of view, by some unknown, incomprehensible power, were and are in fact created by very easy, simple, one could say ridiculously primitive way. They are created by The lightning discharge. They are formed through its enormous electromagnetic force and energy, that is induced into all electrically conductive objects in their vicinity. Any herbal plant is also an electrical conductor, although not very well. The electromagnetic field (field lines) around the lightning discharge have very precise circular shape, like the shape of ferromagnetic sawdust around the wire, through that is flowing an electric current. Described experiment is very well known from physics lessons at school. To a certain extent, may also participate some mechanical forces - pressure and shock waves (both have very precise circular shape, and energy like after the explosion of at least tens of kg of TNT, sometimes much more). Also may participate electromagnetic and mechanical interferences and resonances. 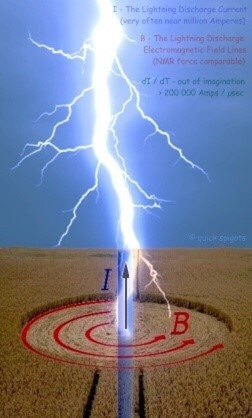 Under certain circumstances, on the lightning strike point may arise rotating electromagnetic field, even if only for a relative short period of time. Finally, it is necessary to mention, that on such place, for several seconds before the impact of lightning discharge, during it, and a short time after, there may also appear electrostatic forces and energy (enormous, almost unimaginable), making stalks and leaves of plants become able mimic the behavior of electroscope. It is possible to create many models of simulation of probable process of creation (exposition) a shape of electromagnetic lines of force inside the structure (raster) of cereal stalks. Their detailed description would be much more extensive, than presumed extent of this article. For instance a model strictly electromagnetic, mechanically – electromagnetic (similar to waves on the water surface, followed by subsequent discharge), model electrostatic – mechanic – electromagnetic, also some others. 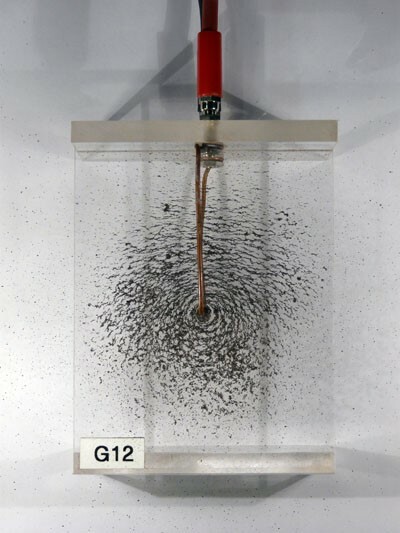 , part Magnetic Fields, page Magnetic Field Lines (Single Wire). Just for interest - through the wire on the photo of such electrical current experiment, was flowing at most a few tens of amperes, and voltage far did not exceed a few volts per meter, often not even one. 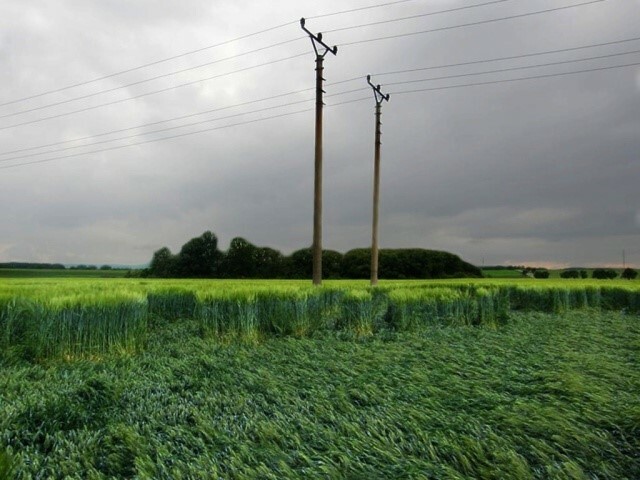 Through the "wire", which perpendicularly intersects the surface of any crop field, and is conducted through its surface deep under the ground, ie discharge of lightning - its electric current is often several hundreds thousands of amperes, in some cases actually close to million amperes, and it happens at a voltage between several hundred thousands to several million volts per meter. This means immediate short-term power peak during the "experiments of Mother Nature inside cropfields" much higher than 10 billion times, against mentioned school experiment. Much more important, than creating models, relatively with difficulty verifiable, and much more important, than almost everything that until now in the field of crop circles research happened around the world, is the fact that the described theory is verifiable. If only the mere fact that it is at least verifiable, as the first and only, assigned to it this world-wide, indelible priority. Just ask meteorologists. The same obviously applies to any genuine crop circle, that will appear anywhere in the world at any time in the future. Well, that's not everything, and in order to lovers of UFOs and aliens and junk science, occultism, spiritualism, ghosts and flying saucers were really sad, this theory is even verifiable retroactively. Also noted there, that possible from 1991, when a crop circle appeared in a strictly protected area near Chequers (weekend residence of brittish Yes, Prime Minister), Her Majesty and the government probably knew much more, than it seemed, and they showed. From that time they only purposefully let their liege people, to play almost Child's Play to be an "investigators" and "researchers", and do not commit other damages and harms elsewhere. Such a person, who is performing one stupidity, is not able to produce another, and greater. Controlled, regulated stupidity and silliness. From the highest level. Just read the statement of then British prime minister's spokesman. (He who seeks, finds on the Internet, and the reference to it is in a linked site ... hermajesty.htm). In terms of practical and experimental agriculture and botany, is possible effects of electrical current and energy on herbal plants classify as abiotic stress factors (like, for example, excess or lack of moisture, light, oxygen, deficiency of CO2, minerals, exposure to high or low temperatures, mechanical stress). Their effect is often also very gradual, visually observable up to many days after the beginning of their action. Furthermore, the effects of electric current and energy on herbal plants, are in some cases, visually almost identical to those of herbicides, that are arranged between the biotic stress factors. The onset of their effect also lasts for at least several days, even in the case of plants that are affected by the dose highly exceeding the lethal limit. Above all, is necessary to realize that any crop circle is almost never discovered immediately, after it has been thanks to the storms and lightning discharges created. Not only from that time point, when it had become visible. But, to make matters worse, by no means, it is not everything at all. Much worse phenomenon, that is able all the "explorers" totally confuse, is the fact, that crop circles are actually created, ie become observable, almost always at least five days, after they have been really created by lightning discharges (verifiable). Possible say "exposed", like a photo-snap (latent image), on cinematographic film. Very often up to several weeks. This statement is in extremely perfect conformity with effects of those mentioned abiotic and biotic stress factors. The observable changes of some of them often occurs after several days, even weeks, from the time they in fact objectively started to act on the plant. It depends on the intensity of the effect, and in case of extremely strong influence, may occur significantly faster, also visually. Similar phenomena, in nature, however, occur extremely rarely, although experimentally is possible to cause them (for example, 100% immediate discontinuation supply of moisture to the roots). In addition, immediately or later after the damaging by electricity, may be some weakened plants more easily accessible to be attacked by a variety of pathogens. Very often happened, that on some of controlled cereal fields, quite objectively, one day in the evening there was nothing observable (absolutely no flattened crop, or only quite negligible minimum). Described fact is possible to document by proofs, for instance by coincidentally taken photos, or at least by a testimony, sometime of many people. Such situation may happen for instance in a case, when such a place is near some frequently visited point, such as monuments or observation tower. Then, the next day, there is possible to observe crop circles, completely lodged crop, lying on the cereal field ground surface, in areas of tens to hundreds, or more of square meters. All observers therefore deduce absolutely the same, absolutely clear conclusion - such crop circles, or any other shapes, someone, or something, had to create during the night, because yesterday they were not present there at all, and today they are easily observable and visible. That was one of the greatest (or better say most frequent) errors of mentioned researchers, that was over decades repeatedly committed by them. The real cause of crop circles origin in fact took place at least a few days, sometime weeks earlier. Although an error it was really serious, and continually repeated, the point is that by no means it was a fatal error, that explorers during years of their "research" committed at least three. Much worse, and much more serious. Although it is really a serious mistake, but to some extent excusable. Mother Nature uses for its creation, to create the impression, that crop circle was formed during a completely different period, than it actually was, used such a perfect camouflage, "mystification", which one can only imagine. A better natural camouflage, than to evoke a clear impression that "Crop Circles did have to be made exactly, or almost exactly at the moment, when the crop stalks within them bent down to the ground surface", perhaps not even possible to imagine. However, the actual moment of creation (exposure) of crop circles, and the first moment of crop lodging are almost always different at least by several days. Previous research of crop circles has been largely, and sometimes almost from the beginning, influenced by a number of errors, very subjective judgments, and in some cases even extremely fatal professional errors (botany, agriculture - nodes - microwave radiation, meteorology - electrically charged whirls - Vortex, exploded nodes, expulsed cavities). Their detailed characterization would considerably exceeded the expected scope of this article, so perhaps it is sufficient that on the pages of the referenced site they are somewhere already described in sufficient details. Such errors, of course, never have been caused through the effort of professionals, however, only by lay, amateur and unprofessional approach of self-proclaimed "experts". Some of them is possible partially excuse, because they were created due to amazement, astonishment, consternation, seeming incomprehensibility up to supernatural, and thanks to Mother Nature's perfect camouflage. Really only partially, because amazement, astonishment and consternation is not possible classify as scientific work. In addition, some mentioned errors may be considered as targeted misinformations. Such misinformations may be used for instance to create profits, or to keep the public in fear of extraterrestrials, or both (by publishing multimillion impression of books about extraterrestrials, forming crop circles). It has become relatively typical, but also somewhat sad fact, that by many of their own statements about crop circles, some of their explorers on themselves, inadvertently reveal that neither they, nor their "consultants" have almost no idea about botany and agriculture, even in practical or experimental area. Shows an absolute ignorance and lack of any experience with just for instance the chronology of plant responses to biotic and abiotic stresses. Experienced botanists and farmers, in fact never search the beginning of the cause of weakening and wilting of plants in the nature a few minutes or hours before they become visually observable, but more often for days or even weeks before. It was sufficient only to ask. Crop flattened in regular shapes, also completely irregularly, has never been flattened (lodged, lying on the ground), because that upon it worked just before it any short-term mechanical force or radiation. Similar forces (mechanical - wind, rain), really may take effect on plants, a short time before definitive lodging, but never are the real cause. Crop is weakened (by electricity - abiotic stress factor, followed by objective continual weakening of the mechanical strength of plants, their parts and tissues) so much, that they are not able to hold their own weight, or unable to survive forces to which healthy plants easily withstand (wind). Healthy, undamaged crop easily withstand extremely strong winds. Stalks of plants, affected by an abiotic stress, after irreversible changes inside their tissues, continually weaken, even if very slowly, until harvest. Experimentally verifiable, in the nature and in the laboratory. IIt's basically just a matter of that, at what exact time point they will weaken to such an extent, that they are not able to hold their own weight, or exposure to light wind, or short-term increase in weight due to moisture. The speed and intensity of weakening much depends on the overall intensity of the phenomenon, that it caused - ie the amount of energy that affected the plants. Verifiable. At some time point, may take effect very significant contribution the Domino effect - for example, just after the short increase in weight due to moisture - during the night or rain. Verifiable. Experts note (photography): the best would be for the most accurate determination of the point of impact of the lightning discharge, a record provided by two devices (stereophotography, stereophotogrammetry), when setting stereoscopic base several meters, even more than ten. 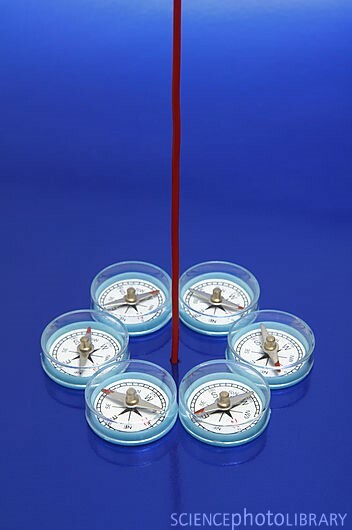 In such a case, it is possible to determine the point of impact of the lightning with the accuracy of meters to tens of meters, even if the distance of the discharge is several kilometers. In the case of very short-distance from the discharge (one hundred to several hundred meters), just for example in the field of cereals, it is possible to quite accurately determine the point of impact from a single image or video footage. Czech scientific research (five years of intensive, continual, top-secret scientific investigations, discovery, research and development - from about February 2008). Also, possible say, it was "a work for British Queen", explaining, who "is making mischief" on her garden. All subsidize from its own resources, no other sponsor. , also prepared some others, almost a hundred. Author of the web owns probably the largest database of precise GPS data about crop circles, found during several decades around the world, that was ever created. At present it contains about 2,000 items, and on the named site will be gradually all published, also with models placed in the terrain in Google Earth, where possible. Described research is related to a number of fields of human activity, whose (academic) specialists possible to consult with: agriculturists, meteorologists, archeologists (also aerial), physicists and many others. Also photographers - very interesting for them, that old - school, especially for those, who have experience with classical photography and cinematography (exposure, latent image, developer, fixer). It is important to remember, that it takes several days or weeks, before a crop circle arise (or any other symmetrical shape of interference and resonance). The reasons are very slow biological processes of weakening in plant tissues, damaged by electricity. Quite common, natural, scientifically well-known, studied and researched reactions of plants to abiotic stress factors. Typical eg from the point of view of response time and chronology. Verifiable, proven, it is always possible to demonstrate by repeatable and reproducible experiments on thousands plant species, annual and perennial. Sufficient very simple, sometimes even primitive experiments, at primary school level. All of them may be of course easily statistically evaluated, but also undergo a rigorous statistical analysis. Basically, this is just a completely natural reaction of plants taking place in time. From a professional point of view - plant responses to abiotic stress factors. They are researched and verified every year in thousands of practical and experimental botanical laboratories around the world, with verification of chronology of the development of many days from the onset of stress factor. Never any unexplainable and unimaginable processes, only quite nature and natural effects. Absolutely no sensation. None mystery, miracle. Quite common, normal, scientifically and experimentally very easy explainable processes. Every lightning is detected, time, GPS, el. current, polarity, multiplicity, ie the number of subsequent discharges (possible ask meteorologists). People creating crop circles? Very ridiculous and inaccurate attempt to mimic natural and completely nature process. Does not exceed a fraction of one percent of discovered shapes, also that never found. However, the shapes, created by humans, are "discovered" absolutely always. Also possible take into consideration other method of finding and verifying previous lightning strike. For example, in the UK there is a tree in the field (fenced, ie inaccessible to the public), near the airport, where there was a crop circle just around the tree, that was positioned exactly in its center. Typical lightning markers will be possible to find on the tree yet today, many years after the event. A separate chapter represent crop circles, which occur throughout the year all over the world, but they are never discovered. These are formations of about one meter, at most two, but also less than a meter. Crop is situated inside them just in the same manner, like inside that larger, clockwise or counter-clockwise, with a relatively sharp edges (especially soon after their creation). There is very often also present a typical sheaf of standing cereal stalks in their center. If they are alone, do not represent an interesting target for sensationalist public or journalists at all. Therefore around them are never jogging dowsers, photographers or persons with terrified look on their faces and a compass in their hand. The only one, who was perhaps able momentarily catch sight of them, was the operator of harvester, or harvestman with a scythe. The number of similar small crop circles may be estimated annually at least several thousand over the world, maybe much more. Sometime they form only a section of much larger and much more complex formations, that are already investigated by sensationalist public. The author himself owns for example copied cutout of photographic map base from Google Earth, crop circle in Czech Republic (2008?). Diameter of about 30 meters, which has never been discovered or explored. More details about it some other time. Several others smaller, never discovered, mostly from Italy. How many crop circles were found after storms, stormy weather? Also long time after - many days or longer. Also every of so called "anomalies", found near and inside crop circles, are absolutely and only effects of preceeding lightning strikes. Magnetic anomalies (compass), dead flies or other animals, burnt plants. Also many other effects, some of them not published yet. Author of this new theory is able to pronounce a number of very interesting, so called predictions (more than five) - scientifically respected evidence (if proven objectively), what will happen in the connection with discovery of crop circles in future. Described events were never identified in past. Described processes (formation of crop circles, but also any irregularly lodged crop) are very similar to the photographic recording and subsequent chemical process of photographs and cinematographic films. It is possible to ask the photographers, "old school" - for them are such explanations very well understandable. At first is created a latent picture, (during a "flash" illumination ;-))). After that was in progress for a very long time a chemical (biochemical) development (developing) of the image. For example, in aerial archeology, is very similar process described as "In this way, vegetation acts in somewhat the manner of a chemical developer of exposed photographic plates: it throws up the latent pictures." (Flights into yesterday: The story of aerial archaelogy, L. Deuel, St. Martin's Press 1969, p.38). Aerial archeology is almost never mentioned by any crop circle self-declared "researchers", "investigators" and other "specialists". But there is possible observe very interesting interconnections between aerial archeology and crop circles. Not only, that many crop circles found, are immediatelly interconnected with archeological remains underground, and some of their parts appear as classic cropmarks (in aerial archeology commonly used term, see). The second, but maybe much more interesting, is the genius loci - the locations of the most frequent occurence of crop circles, and the localities, where the most important, the first promoter and discoverer , founder of aerial archeology - O. S. G. Crawford, firstly in his youth observed barrows, burial mounds, vaults, crypts, tombs, henges, earthworks, ditches, hedges, scattered across the landscape and sketched them. He noticed a very significant influence of identified and expected underground structures, to the nature and variations of vegetation growth, which is located above them. Mostly cereals, but also other kinds of crops. In Hampshire and surroundings. Later continued in aerial (also ground) archeology investigations and observations over the whole Wessex - (Berkshire, Dorsetshire, Hampshire, Somersetshire, Wiltshire). At locations, that provide a huge amount of objects and remains suitable for such research and investigations, and later were "filled" with crop circles. Local conditions (genius loci), in a described way quite simply and understandably, urged him to the implementation of similar studies, and by its mere existence and presence, so significantly contributed to the discovery and inventions in the sphere of aviation archeology. Thanks to that encouraged one keen observer in his observations and researches. Is everything only a coincidence? Nowhere else in the world probably on the inhabited and cultivated areas in such a high concentrations similar archeological remains occur, and may be very substantially participating in the formation of at least some crop circles or their parts. The lightning discharge may in many cases probably act like a great intensifier, highlighter of cropmarks, which due to it may be found in a number of cases even on such a places, where inside the structure of cereal crops for many years before or after, was not observable anything at all. Therefore they may exhibit effects, such as lowered electrical resistance of such structures. However, they are localised at such a depth underground, that without the passage of electricity from the lightning discharges through the vegetation structure and their roots, show other years absolutely nothing. 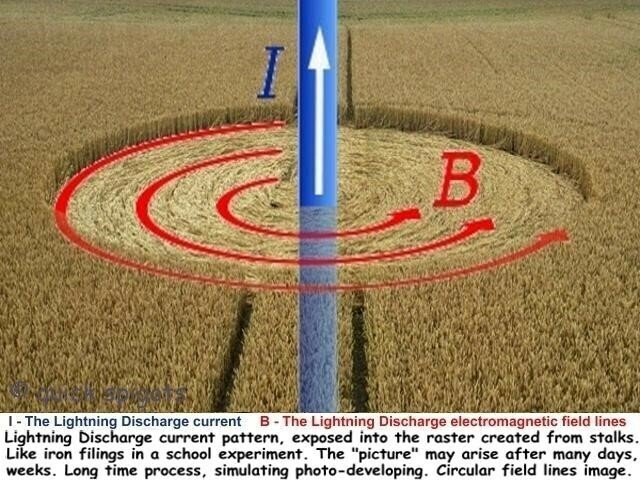 The lightnings electricity - cropmarks intensifier, highlighter, and developer of such cropmarks (deep structures), unidentifiable and unobtainable by any other method. Already Crawford observed by himself, that in some years, on some fields, appear vegetation symptoms, which many years before or after were not observable, and within his means, very correctly concluded, that the most likely it is just about the influence of weather. Illustrative images on the left show just only cropmarks, and with crop circles have absolutely nothing in common. Similar images can be found thousands by targeted search, enter the password and search for images. 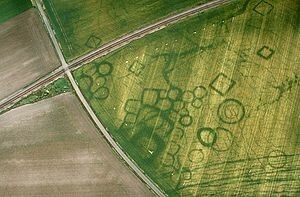 Cropmark, aerial archaeology. Some cases of crop circles may be nothing other, than cropmarks (hand in hand with them, sometimes there are present changes in soil resistivity, also called resistance symptoms). Because, sometime possible located at such a depth, that, without very intense amplification and visualization through passage of the electricity from lightning through points with reduced soil resistance, and thereby caused damage to plants over them, would be never seen by anybody in other circumstances. Also possible say, that almost every lodged, flattened cereals in the whole world (say, much more, than it was presumed in previous times), are lodged - lying on the ground, thanks to the damage by electricity from the discharge of lightning. Author of this theory is a son of an agricultural researcher, who attended more than 50 years to an academic agricultural research and development, cultivation of cereal crops (Poaceae), mostly corn. Therefore possible ask the question, why do not arise a crop circle or other symmetrical shape on any such place, where lightning bolt hit the field with cereals. In more than 99.9% there is not present such symetrical structure, but almost always (more precisely say, in statistically significant, sufficient number of cases) possible find there only common, irregularly lying crop (fairly reliably verified, but above all - anytime verifiable). One of the possibilities of described effect (so infrequent occurrence of crop circles against commonly, irregularly lodged, flattened cereals) is for instance such, that regular and symmetrical structures may be formed primarily in the case of extremely strong discharges, ie electric currents more than 500 thousand of amperes (less than 0,1% of cases). Extremely strong el. current is a cause of extremely great electromagnetic field (circular). The other possibility is, that in the case of extremely strong discharges they may be the cause of an effect similar to the dielectrical breakdown (of the Earth - field surface), and the currents (energy) from the lightning are not dissipated over the field surface (and thus creating "an exposition" of irregular shapes of damaged cereals), but immediatelly connected to the deep underground. Such a hypothesis had to be confirmed, now it is a theoretical hypothesis only. The author is aware of the fact, that this is a similar kind of reasoning like: "All cats have four legs. My dog has four legs. Therefore, my dog is a cat." (Yes, Prime Minister). The author is aware of a weakness such consideration, but on many places on the web are thoughts much stronger, better provable and verifiable. , it is possible to find events indistinguishable from those found inside regular formations (nodes, bundles of stalks lying on the ground). Some other explorers with similar shapes also occasionally engaged, but absolutely not in such a great extent. Mostly only as a note, as a curiosity, or only one of many another very hardly explainable effects. Italian explorers, as probably the first and almost the only ones, are able to understand, that regular and irregular shapes form together quite inseparable parts. That stalks and any other plants inside them were exposed to absolutely the same effects and forces (from the scientific point of view, they may be sorted between the effects of abiotic stress factors). With the only difference, that regular shapes are found annually in several tens or a little more cases, and that of irregular are found in cereal fields around the world during the same period many millions. Thank you very, very much, sunny Italy! Well, you want to claim, that I am not true? Prove it! And what about if all this new theory would not be proven as true, right, and will be verified only as a complete error? Well, at least, I just tried it. I had to do it. Result of a lightning discharge hit into cereal field (lightning rods easily observable there). The situation, shown on the photo, become in majority of cases at least 5 days, mostly 10-14 days after the lightning discharge, sometime much later. The first several days after the storm and lightning is on such affected crop field observable absolutely nothing. Mentioned situations also recorded, photographed.